'Laughing in the face of jealousy' Acrylic paint, gold and silver leaf on heavy water-colour paper, 57x76, 2006. Copyright Tashi mannox 2009. 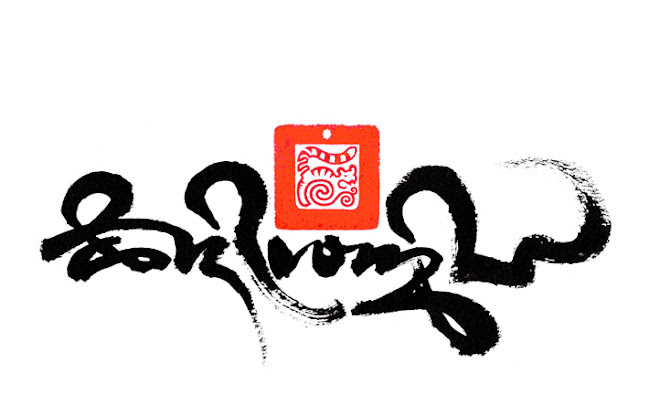 This website features calligraphy art pieces spanning the past ten years to Tashi's current full colour Illuminated Iconographic master pieces, as above. 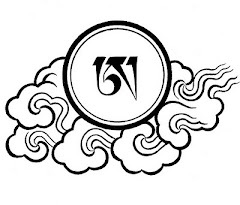 Tashi’s creative process involves a fundamentally meditative approach, based firmly in a life long dedication in traditional Tibetan calligraphy. He attributes the element of spontaneity in his work to "the Ultimate Mind", which, he believes, is as instrumental in shaping the final image as his brush. In the execution of the contemporary Tibetan calligraphy pieces, Tashi’s trained brush strokes move freely across the paper, harnessing the power of both negative and positive space. 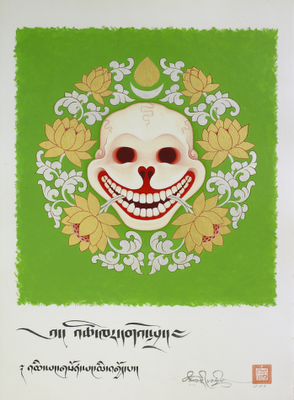 The philosophy at the heart of his creations is born from his years as a Buddhist monk. Moreover, the influence of his western heritage and personal charm and vitality make these fascinating contemporary works. 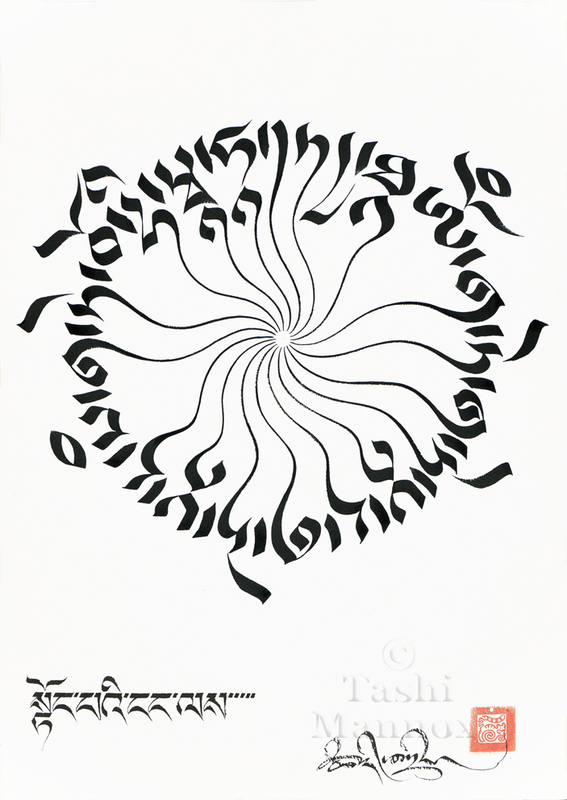 Using pure, almost sculptural forms in many of his works, combined with wit and insight, Tashi produces works that vary from a more abstract, confident and bold expressions, to a lighter and precise calligraphy that seems to dance around the page. This variation from playful to serene connects with the viewer, evoking a sense of intrigue, space and ease. 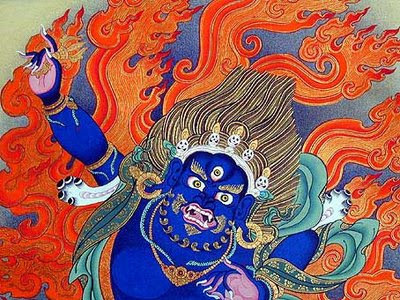 The introduction of colour and iconographic images in Tashi’s later works; illuminates his calligraphy rich in symbolism and meaning. 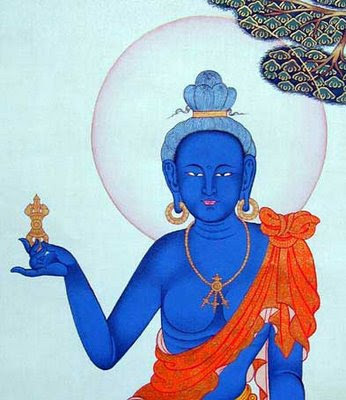 Click here to hear an upbeat version of the Heart Sutra in Tibetan by Jigme Khyentse Rinpoche, produced by Gary Dyson. "Emanate from Emptiness" Tashi Mannox 2010. 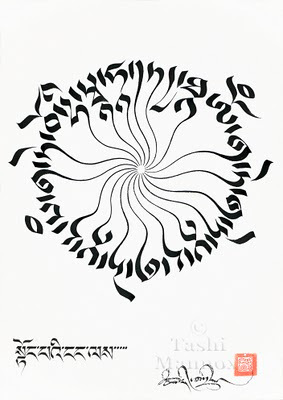 The above calligraphy is in the Dru-tsa script style, the tails of the letters swirl to the center as if Emanating from Emptiness. Tashi Mannox, ink on paper 38x56cm 2010. The below page from the Heart Sutra survives the destruction of Tsurphu monastery in 1959, the original seat of the Karmapa's in Tibet. An old monk friend pulled this old text page from the rubble of Tsurphu during its restoration in the 1980's. This page is clearly from the latter part of the Heart Sutra, painted in a gold Uchen script on a black polished paper. This is a technique used for the more important illuminated manuscripts, such as Sutras, evidently robust enough to survive the 30-40 years buried, though it did not seem to escape a splattering of Yak dung!